Stackable Chairs Offer Unique Bistro Seating That Complements Mayline'S Bistro Hospitality Tables And Provides A Contemporary Solution For Breakrooms And Meeting Areas. Escalate Chairs Are Perfectly Sized For Dining-Height Tables. Sleek Design Includes A Hard, Black Plastic Seat And Back That Are Molded For Comfort. Silver Frame Includes Four Chrome Legs For Stable Seating. Chairs Stack Up To 25 High. Each Chair Holds Up 250 Lb..
Stackable Chairs Offer Unique Bistro Seating That Complements Mayline'S Bistro Hospitality Tables And Provides A Contemporary Solution For Breakrooms And Meeting Areas. Escalate Chairs Are Perfectly Sized For Dining-Height Tables. 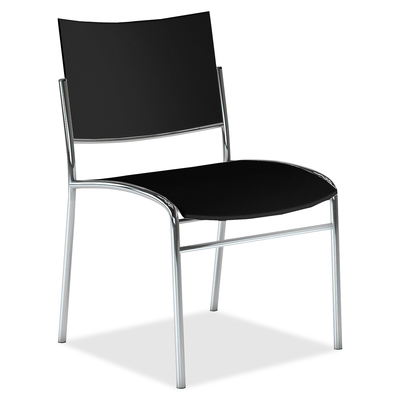 Sleek Design Includes A Hard, Black Plastic Seat And Back That Are Molded For Comfort. Silver Frame Includes Four Chrome Legs For Stable Seating. Chairs Stack Up To 25 High. Each Chair Holds Up 250 Lb.